I once ordered hummus as part of a starter course for our table of four. Like with wine, the one who orders should also be the taster. I ate it spoon by spoon, no bread, nothing. Just hummus. We had to order more. Such is the compulsion when faced with a good hummus. I love this kind of eating, more like grazing, really. It’s one of the most popular ways to mingle over food – unhurried and very communal. In the past, hummus recipes were more purist. Just chickpeas, tahini, garlic and lemon. It’s gone from plain and simple to spruced up with roast root veg or handfuls of fresh herbs mixed in. For this recipe, I added white beans to the base and dressed it with candied sumac tomatoes. Labelling hummus a dip seems almost flippant. It trumps all other snack board contenders. 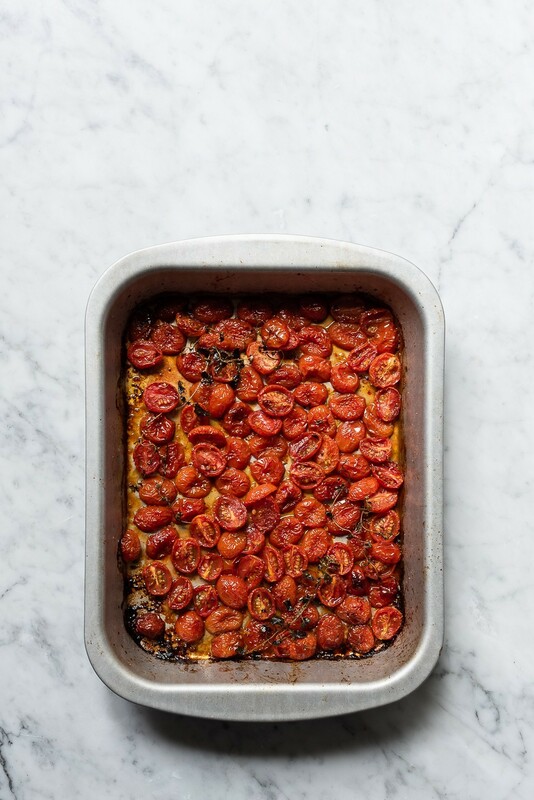 This is the last in a series of four recipes I’ve developed for ZZ2 Romanita tomatoes. 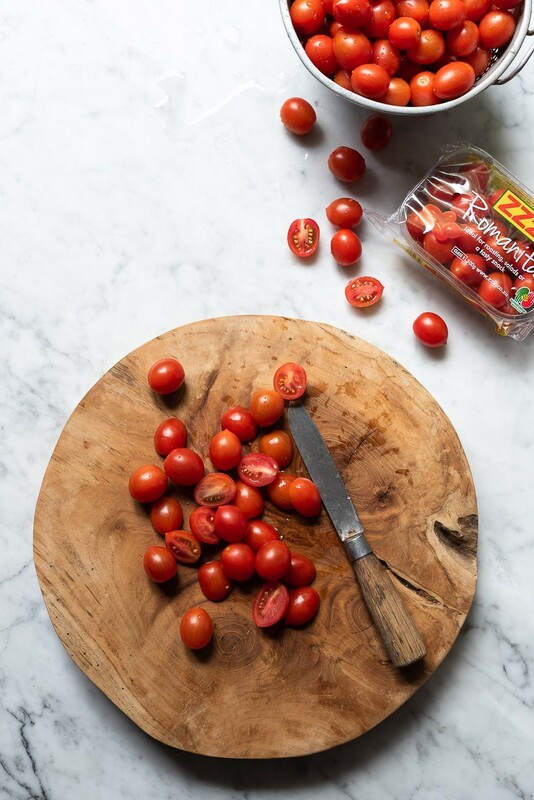 Over the past month, we’ve looked at alternative ways to use these sweet and juicy plum tomatoes, other than in a salad, that is. If you’ve missed them, be sure to check out the Harissa chicken tacos, shakshuka or tomato galette. When it comes to roasting tomatoes, I always make double. Whatever’s left over, I use as omelette fillers, mixed into frittatas or for avo toast toppings. To encourage that tacky toffee-edged blistering, a light scattering of brown sugar gets things moving in the right direction. Drizzle the tomatoes with a peppery olive oil and season the cut side with salt and picked thyme leaves. Then it’s into the oven until the tomatoes yield to the heat and trickle their acidic sweetness into the pan. For the hummus, I used a combination of white beans and chickpeas. The beans have a soft creamy texture. You could of course, make it with just the beans, but I find the chickpeas lend a sturdiness to the consistency of the hummus. Essential to serve alongside is a carrier. Vegetables like baby radishes, carrot sticks and the likes are an obvious choice, but crisp pitas are even better. To make the pita crisps, slick the bread with olive oil and season with dried oregano, then bake in a hot until golden. Preheat the oven to 200 C. Line a roasting tin with foil and spray with non-stick cooking spray. 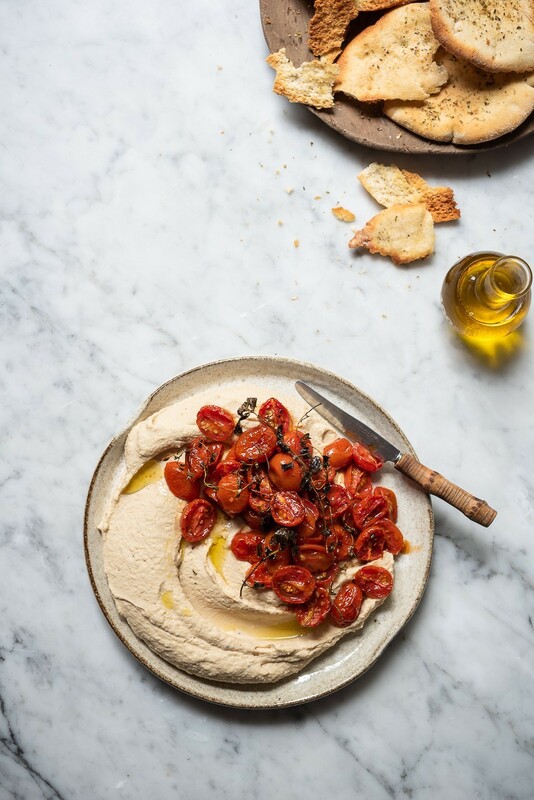 Spread the tomatoes onto the tin, drizzle with olive oil and season with salt and pepper. Scatter over the chilli and tuck the herbs in between. Roast for 45 minutes. Sprinkle the tomatoes with sugar and roast for another 5 minutes. For the hummus, place all the ingredients in a blender and blitz until smooth and creamy. Arrange the pita breads on a baking sheet and brush with olive oil. Season with salt and oregano and bake for 15 -18 minutes until crisp and golden. Snap into shards. 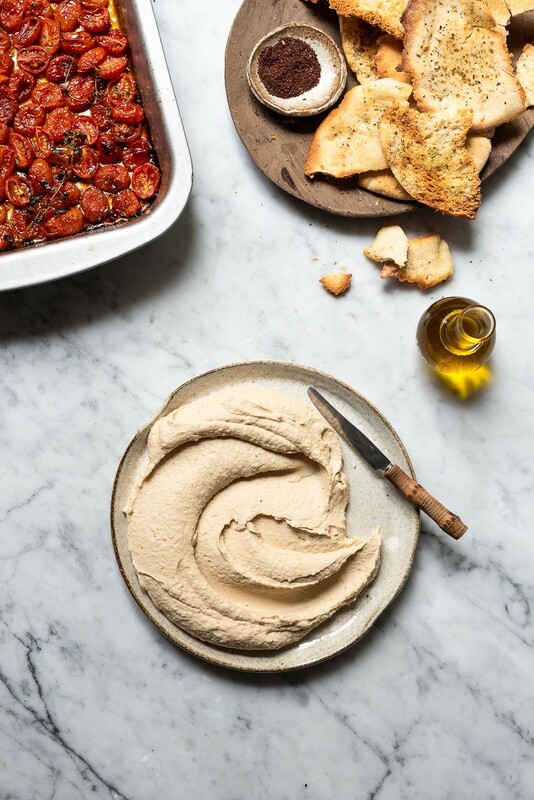 Spread the hummus onto a serving plate. Pile the tomatoes on top and drizzle with a little extra olive oil, if you like. Serve with warm pita crisps. 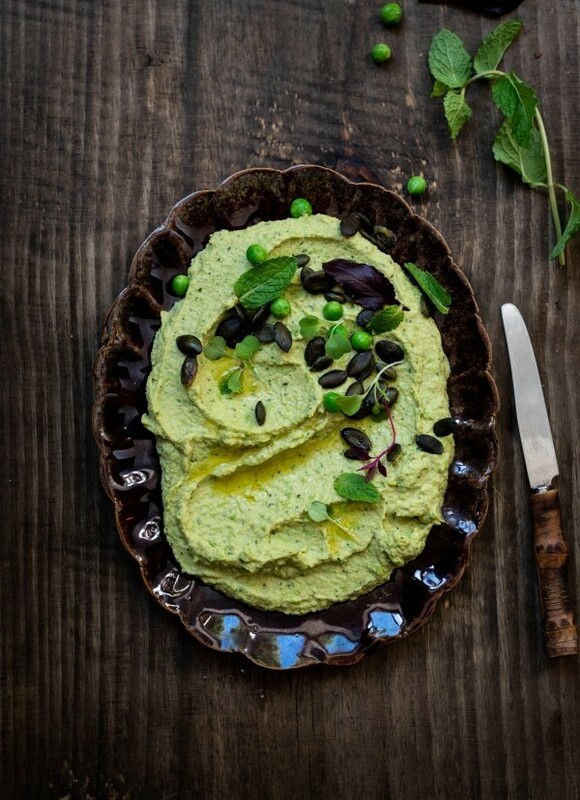 Hummus takes on a many guises. 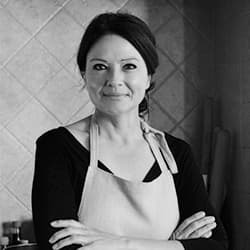 Here’s another favourite from Melissa Delport’s beautiful cookbook, Whole.